In stock -This product will ship today if ordered within the next 1 hours and 51 minutes. 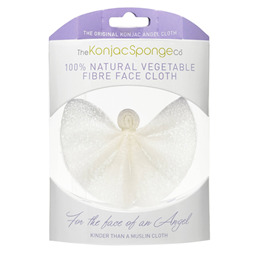 The Original Konjac Angel Face Cloth is an amazing, innovative facial cloth. Once wet, the angel unfolds to reveal a soft exfoliating cleansing cloth. It is ideal for removing face masks and is also kinder than muslin cloths and flannels which can be too harsh for the skin. The angel simply exfoliates and leaves the newly formed skin conditioned, fresh and undamaged. After use, skin is refined, looks radiant from the deep yet gentle kiss of the Konjac angel. The Konjac Angel Cloth is additive free, helps balance pH levels and is suitable for sensitive skin, leaving the skin feeling radiant and rejuvenated. Before use, rinse and hydrate your Konjac Cloth in warm water. Squeeze out any excess water, and gently cleanse skin. It is not necessary to use cleansing products, but a small amount can be added to your Konjac Cloth if desired. If a cleanser is added, the cloth will help the product work harder, and go further. After use, always rinse your cloth well, and allow to dry in an airy place between uses. Never leave the cloth in the shower or in a pool of water. Your Konjac Cloth is a 100% natural vegetable product and should last 2 to 3 months. Once it starts to look tired and/or breaks down, replace it. The Konjac Cloth can be safely composted or used in the garden to help water your plants by holding moisture. Never leave a child unattended with the cloth. Below are reviews of The Konjac Sponge Co Original Konjac Angel Face Cloth by bodykind customers. If you have tried this product we'd love to hear what you think so please leave a review. The Original Konjac Angel Face Cloth is an amazing, innovative facial cloth. Once wet, the angel unfolds to reveal a soft exfoliating cleansing cloth.